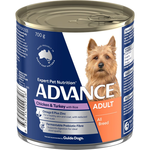 Buy Advance dog food, puppy food and cat food online at Pet Circle and enjoy the convenience of delivery straight to your door, always at the best price. 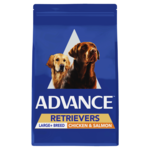 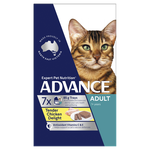 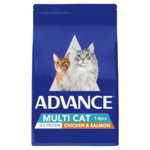 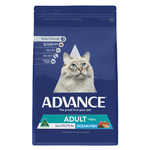 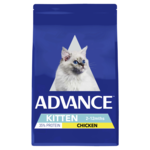 Advance pet food is a super-premium pet food diet scientifically formulated by Waltham Centre for Pet Nutrition – a principal authority in pet nutrition science – to produce top of the range nutrition for cats and dogs. 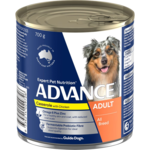 Forget cheap pet food: Advance creates tailored nutrition to meet age-specific requirements as well as breed-specific requirements. 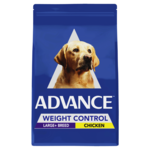 With different diets available catering to all shapes, sizes, ages, and activity levels, there is sure to be a diet for every pet. 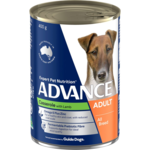 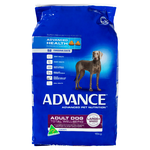 Advance pet food is made in Australia, specifically for Australian pet - making it among the best dog food in Australia. From the humid tropics to the arid outback, the Australian climate invokes a particular lifestyle; Advance has formulated their foods to cater particularly for these conditions, and addresses issues like skin and coat maintenance, joint care and immune support. 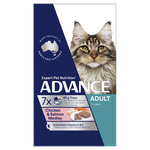 Advance caters to pets of all life stages by formulating food based on highly specific nutritional factors associated with the age of your pet. For example, for a growing pet (puppy or kitten), a diet such as Advance Puppy Plus with higher content of calcium, phosphorus, protein and energy is needed. 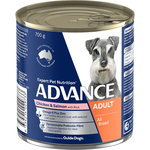 Likewise for seniors, a diet with fewer calories and higher content of joint-supporting nutrients are required. Not only does Advance cater for the age and size of your pet, but specific health issues are also addressed through their nutrition. 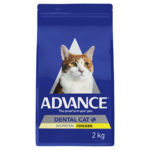 Advance has designed complete, balanced diets which help manage issues like dental disease, skin issues such as allergic dermatitis, and obesity. 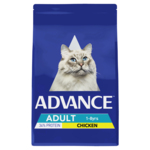 Appropriate dog and cat food feeding guides are available on packaging. 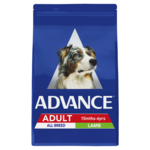 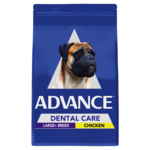 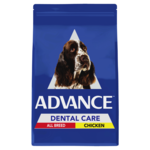 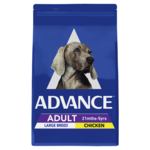 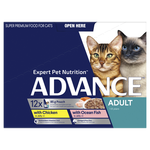 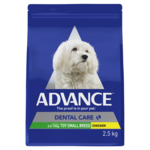 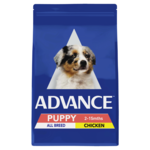 Advance has a diet for puppies, kittens, adult small and large breed dogs, adult cats, senior dogs, senior cats, and active dogs, as well as diets for dental health, weight loss, sensitive stomach and sensitive skin. 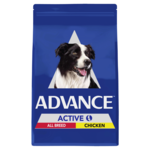 For an active working breed adult pooch with a higher requirement for energy, Advance Adult Dog Active is completely balanced for you. 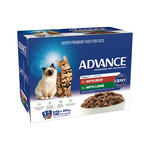 Perhaps you have a growing puppy or kitten and need a top-quality diet to support their high metabolism and growth? 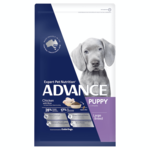 See Advance’s Puppy or Kitten range. 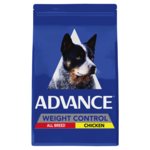 Or do you have an old pet who needs a diet that will support their joints and provide a low fat yet still completely balanced diet? 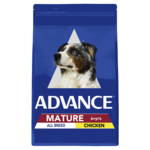 See Advance's Mature and Senior varieties.